Field hands perform excruciatingly painful mutilations on all male cattle, and some female cattle. Anesthetics are never used and no veterinary after-care is provided. Beef cattle are all branded to establish the identity of the farmer and re-branded at each change of ownership. In the intensive confinement systems that characterize modern factory farming, cattle are grouped into enormous herds, therefore castrating the males makes them more passive and easier for the farm workers to control. Castrated males also reach a saleable weight more quickly. Cattle in beef herds are naturally horned, and having horns would make them dangerous to handle. To avoid disfiguring scars that would lower the value of their leather, and for worker safety, their horns are cut off. In the dairy industry, where most cows are kept indoors and in close quarters, tails are amputated. The dairy industry claims this promotes cow cleanliness, milk hygiene, ease of milking, and protection for workers from leptospirosis. Scientific evidence shows that this practice is unjustified, and that routine vaccinations for staff are a better prevention of infection. The traditional method of identifying ownership is to use hot branding. The calf is roped and wrestled to the ground, or dragged into a squeeze box, so a field hand can burn a logo into his hip or side. 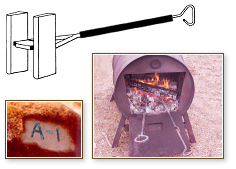 The branding iron is heated until it is red-hot and then stamped through the fur, creating a severely painful third-degree wound and a permanent scar. In some countries, Israel and Australia for example, freeze branding is more popular. The brass or copper tool is dipped in liquid nitrogen or dry ice to bring it to a super-cooled temperature. It is then applied to a clipped area on the calf's side with pressure and a rocking motion, painfully burning in a welt in the shape of the branding logo. Also for identification purposes, some ranchers cut out a part of the ear (ear marking) or, more grotesquely, cut a chunk of flesh from under the cow's neck ("wattling"). Branding and marking are done without pain relievers, and accidents to cattle and workers are commonplace. Owner identification is only one justification for branding cattle. In some countries, regulatory agencies require permanent scarring as a way to track certain diseases like brucellosis and tuberculosis. Therefore, government regulations perpetuate an identification and traceability method long out of date. Implanting microchips is an accurate and pain-free alternative. Within their first 10 days, young calves raised for meat are castrated. They are either flipped over and held down on their sides, or they are held within restraining gates. They are terrified and panic-stricken throughout the procedure, while a farm worker (not usually a veterinarian) removes or crushes or slices away at their testicles. There are two options for surgical castration of these calves: a knife and an emasculator. When using a knife, the cowhand must wrestle with a struggling calf and proceed quickly — usually roughly and carelessly. He cuts away the lower third of the scrotum, reaches in and yanks down on the testicles to destroy the cords. A sizeable opening is necessary to allow for drainage during healing. The emasculator is a tool with a cutting and a crushing surface that can slice away the testes and crush the blood vessels and spermatic cords all at the same time. As this is a full-fledged surgical procedure, all instruments used should be boiled and the scrotal sac disinfected thoroughly. Antibiotics and fly repellents are important preventives to avoid local and general infection, tetanus, complications from swelling, and insect infestation. Instead, as a token measure of care, a worker might spray some disinfectant or antibiotic on the bloody mess. A bloodless alternative, performed during their first two months, is to use a hand tool called a "burdizzo." Shaped like a pruning clipper, it is used to cut through the spermatic cords and blood vessels above the testicles. Infection, maggot infestation, and gangrene are potential risks. Another method, where very tight rubber rings are applied over the scrotum using an instrument called an "elastrator," is often used before the calves are 10 days old. It is also a bloodless method, but it is horribly painful and carries the risk of tetanus. The later cattle are dehorned the more complicated the procedure. Therefore, a majority of calves have their horns or horn buds removed at a very young age, at the same time as they are branded and castrated. These baby animals have just been burned on their flanks and cut into between their legs; they are in great pain and struggling to get free. One worker holds the calf's head firmly while another tries to scoop out, or burn away, his emerging horns. It's no wonder that accidents happen, such as when the worker, while hammering away at a small horn, actually cracks the calf's skull. The horn is a hollow extension of the skull, and breaking it off exposes the sinuses and cranial membrane. Numerous methods have evolved reflecting cultural or regional differences, and a great variety of tools have been developed: caustic acid, knives, nucleator, debudding spoon, tube dehorner, gouge or Barnes tool, Hodges or Keystone instrument, electric dehorner, electric or gas-fired hot iron, embryotomy wire, and hacksaw. 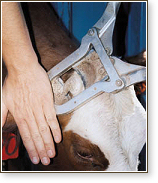 Caustic acid is applied to the horn area of the calf. The substance can run down his face, permanently scarring and blinding him, especially if it starts to rain. Iron tools are heated (gas or electric) and pressed into the head, circling around the horn bud for some time, traumatizing the area. Other tools, which in fact are surgical implements, are used to gouge out, chop off, or cut away the forming horn, leaving an open wound susceptible to infection and complications while healing. In the case of adult cattle, the horns are usually cut down with an embryotomy wire or a hacksaw. In the rare circumstance that a veterinarian is called in (almost never in an industrial factory farm setting), lidocaine is used to block the nerves before the procedure starts. The public understands dehorning to be a cruel and offensive practice. In Australia, for example, dehorning cattle over one year old without the use of anesthetics is now illegal. It is considered a cruelty offence, a violation of the Prevention of Cruelty to Animals Act. 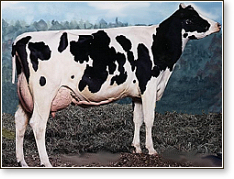 Since dairy cattle carry a non-horn dominant gene, crossbreeding beef cattle with dairy cattle (for example, breeding a Holstein with a Hereford) is a simple genetic solution that produces a naturally non-horned herd. Presently, tail docking is banned in Denmark, Germany, the Netherlands, Norway, Scotland, Sweden, Switzerland, the UK, and some states in Australia. However, after originating in New Zealand as a matter of convenience for dairy farmers, the practice caught on in Canada and the U.S., and it is actually spreading as more cows are confined indoors for their lifetimes. Workers in the industry try to justify this abuse by claiming that cutting off a cow's tail promotes cleanliness of the udder and prevents leptospirosis in workers. In reality, most dairy herds are kept on concrete, slatted floors, or dirt lots, and the barns are simply covered in manure and urine. It is time consuming, and therefore more expensive, to maintain a clean, fly-free environment. Cutting off a cow's tail is essentially a do-it-yourself process, with no attention paid to animal health or suffering — and no anesthetic is used. In very young calves, a tourniquet is applied high up on the tail and the remainder is amputated with a knife, scissors, or even a pruning shears. Some farmers prefer using an emasculator, while other farmers use the rubber ring constriction method (elastrator) from their castration toolbox. In addition to experiencing acute pain during tail docking, the cow can suffer chronic pain from the tumor that forms at the end of the stump. Serious wound infections are also commonplace, sometimes spreading into the cow's spine.